For months, we’ve been walking around with a naked Galaxy S3. Often it’s a dead Galaxy. We wanted a case we could get a charge out of. So we got a $65 “iWalk” case. When your phone needs a charge, you flip a switch on the case and it starts charging. The downside is the case takes more than an hour to fill up the phone and the phone is unusable in the meantime. So we turned to the $50 MagicStick 2800 from Powerocks.com. It’s a slim tube, three and a half inches long, that looks like a mini flashlight. Charge it up and carry it with you. 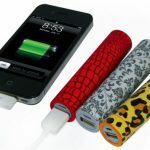 When your phone or tablet needs a charge, use the included USB mini-cable to connect the tube to your phone. You can keep using your phone while it’s charging. OK, so we’re all charged up. But we still didn’t have a phone case. We got the “Cushi.” This is a soft foam pad that sticks to the back of your phone and comes in sizes for iPhones, Galaxy S3s and S4s. 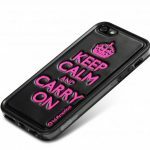 Ours is a black Cushi with the printed motto: “Keep Calm and Carry On.” It looks like it would be over-priced at $5 but they sell for $25 at IDAmericaNY.com. We like it anyway.